This site was designed to be viewed at 800 x 600 or higher resolution, using Microsoft Internet Explorer or Mozilla Firefox. Michael Pasternak as Lieutenant Columbo is the perfect corporate speaker and corporate entertainer. His hilarious, totally personalized program is written entirely around your group, association, organization, company, distributors, franchisees, product or honoree, and can be used for meetings, banquets, awards dinners, tributes, roasts, trade shows, conventions, international events, Christmas parties, holiday celebrations, sales presentations, marketing videos, training films, advertisements and commercials. Michael Pasternak as Lieutenant Columbo is more than just a funny celebrity look-alike, impersonator or impressionist, he is an award-winning actor, writer and comedian with years of experience and hundreds of satisfied clients whose testimonials never fail to be rave reviews. Whether his client is a small business, regional company, multinational Fortune 500 corporation... or he is working with a speakers bureau, meeting planner, event coordinator, catering manager, corporate video production company or ad agency, Michael Pasternak's highly successful Lt. Columbo concept and one-of-a-kind performance is always a comedy hit. 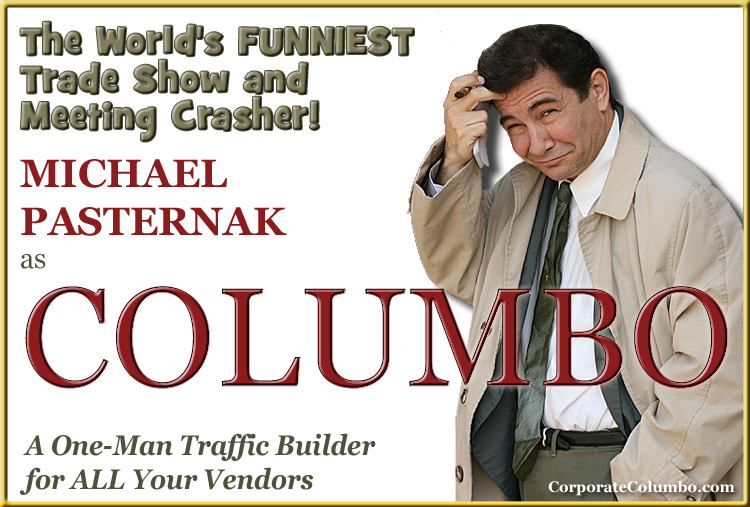 When executives are searching for the ideal humorist to serve as a motivational speaker, keynote speaker or emcee, they choose Michael Pasternak as Lieutenant Colombo to energize their work force, inspire their employees, and make their event a smashing success!